There are plenty of holiday gift exchange games that are appropriate for playing at the office. 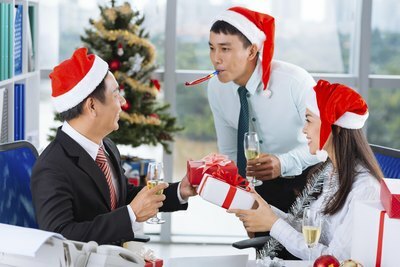 From a secret Santa game to a white elephant swap, office gift swaps provide an opportunity for coworkers to exchange presents, often on a restricted budget. An office holiday gift exchange allows employees to celebrate the joy of giving while bringing everyone together for some seasonal cheer. Secret Santa is a traditional office gift swap game with many variations. To play, first invite everyone in the office to participate. Emphasize that participation is not mandatory, but it is more fun if everybody plays. Once you have the list of participants, write each name on a slip of paper and put the slips into a bowl from which each player will draw a name. The person must then choose a present for the person whose name was drawn. Set a strict spending limit, usually between $5 and $20. Have all the gift givers identify themselves at the end, after the gifts have all been given. White elephant gift exchanges lean toward silly, require little or no money and can be played in two ways. One approach involves all participants bringing a gift from home, usually something they don't like. For the other, everyone brings a funny gag gift, usually valued at $5 or $10. On the day of the gift swap, collect all the wrapped presents in a central place. Draw numbers to decide playing order. The first player gets to pick and unwrap the gift of her choice. The second player then has the option to steal the first gift or to open a second. This continues until everyone has a gift to take home. Ask employees to bring a small wrapped gift valued at $5 or less. Create a list of holiday-themed trivia questions and answers. Seat everyone around a conference table and place the presents in the center. Designate someone to go through the list asking the trivia questions. The first person to raise her hand and correctly guess the answer gets to pick a present. After someone takes a present, she is out of the game. The game continues until everyone has something to unwrap. Ask participants to unwrap their gifts only after the game has been played. Use your holiday gift exchange as an opportunity to get to know your coworkers better. A coworker trivia quiz lets you swap presents while breaking the ice. Ask everyone to bring a wrapped present with a certain price limit and pile all the gifts in the center of a room. All players then write interesting personal facts on slips of paper, which are gathered and placed in a basket. After a designated person pulls a slip and reads the fact, the first person to correctly identify the coworker chooses a present. The game continues until all the slips have been identified and all the presents have been claimed. What are Ideas for a White Elephant Gift for an Office?